Our daughter is getting married next month and will be honeymooning in Mexico for one week and then heading to the Caribbean for their second week of fun in the sun. At the time they made their arrangements, we had never heard of the Palladium Hotels & Resorts. With that said, hubby and I plan on renewing our wedding vows for our 30th wedding anniversary which is swiftly approaching in 2016. Perhaps the Caribbean is on tap for us! Today I was asked to share the following information with all of you about some stunning wedding packages being offered by Palladium Hotels & Resorts. Looks like a beautiful place to have a wedding and/or vacation! Information is below. Through the expertise of popular wedding designer Karen Bussen, Palladium Hotels & Resorts is sharing Simple Stunning Weddings packages for its guests to love and celebrate. The “Waves Of Love” package was designed with inspiration from both the sand and sea. 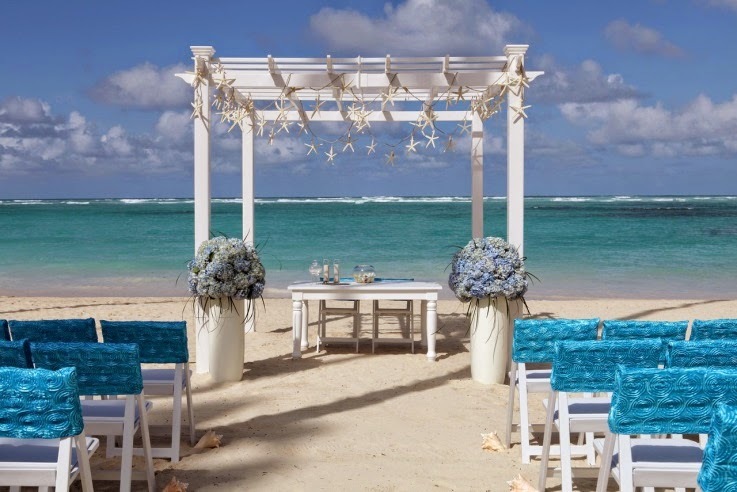 The venues, all accented with starfish garland, range from a gazebo with gorgeous views of the Caribbean waters, a colonial chapel to present a religious element, an indoor site surrounded by lush vegetation, or an open alter outside on the warm sandy beach. Float down a seashell path with a bouquet of hydrangeas toward your soon-to-be husband wearing a boutonniere of dendrobium orchids. Two arrangements of hydrangeas and dune grasses in blue, mixed white and green will perfectly accent the venue and your guests’ white garden chairs. Once you say your “I Dos” head over to the reception to dance the night away. A white tablecloth and blue runner adorn your wedding bar as you propose a sparkling “something blue” toast to your new spouse. Enjoy a two-tiered wedding cake garnished with white shell accents and blue or green ribbon while your guests gaze at a beautiful centerpiece made of shells and floating candles. Share a relaxing morning together for the first time as husband and wife as you rise with the sun and an oceanside honeymoon breakfast. Save the best for last and end your stay beneath the sunset as you enjoy complimentary wine and cheese. There are a variety of additional amenities that can be added to make your big day even more special. Relax in wedding bliss at Zentropia Palladium Spa & Wellness with a One Love Package treatment as you enjoy exfoliations, facials and massages for two. “Waves Of Love” wedding package rates start at USD $2,600 for 10 people. Disclosure: Information & photograph is courtesy of Palladium Hotels & Resorts.